It wasn't easy to pick my favourite travel photo for this month's blog link up hosted by Emma from Adventures of a London Kiwi, Kelly from Around the World in 80 Pairs of Shoes, and Rebecca from Runaway Kiwi. All my holiday photos, are my favourite travel photos. However there is one that is a bit more favourite than others. This photo was taken on a trip to Jamaica where we spent about ten days chilling on the beach in Negril. We were staying at the Negril Palms Hotel on the Seven Mile Beach. It's not a fancy place, but I loved their pool side deck that overlooked the beach and the Caribbean Ocean. At meal times they served great food here, and during the day it was utterly relaxing to just gaze out at sea from their comfy lounge beds that were on the deck, with a cool fruit juice within arms' reach. One morning as I was sitting there, a delivery man for the restaurant arrived and laid a couple of coconuts on the railing of the sun deck and that's what I captured. To me it just brings back that chilled out feeling that you almost always seem to lose as soon as your plane hits the tarmac back in London. That's why I've chosen it for my work computer's desktop wallpaper, so that whenever my days turns out to be a tad bit too stressful, I switch to my desktop and stare at the coconuts and the ocean. It really works. Lol, great for work stress! Ah Jamaica - love the place, we have some stunning photos from our trip there last year! It sure is one to go back to some time. 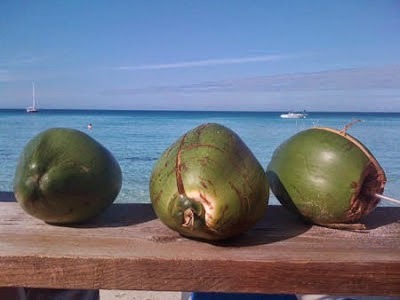 Coconuts are delish.And it is quite healthy apparently. It's so great to be able to recall moments of peace so vividly - and with such a lovely back story!